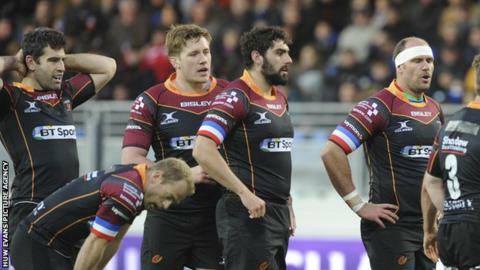 Newport Gwent Dragons fell short against Castres in a pulsating encounter in the European Challenge Cup. Daniel Kirkpatrick and Geoffrey Palis tries put Castres ahead at the break but Dragons responded strongly in the second half. Carl Meyer and Elliot Dee crossed as Lyn Jones' side took a deserved 26-17 lead. But Thomas Combezou and Alex Tulou secured a bonus point win for Castres. Dragons had beaten Sale Sharks 30-12 in the first round of matches while Castres' game against Pau was postponed following the terrorist attacks in Paris. Fly-half Kirkpatrick scored the home side's opening try on 15 minutes, converted by full-back Palis. Dorian Jones opened Dragons' account with a penalty having missed a kick a minute earlier. Palis missed a kick for the home side but crossed for the second try, which he duly converted before Jones succeeded with a second penalty. Meyer's long range penalty ensured Dragons went in at the break trailing only five points behind their hosts to keep them in the game. Lyn Jones' side started the second half strongly and having missed two opportunities to add to their total they were rewarded with their first try. South African Meyer crossed and Jones added the extras. Within a minute Palis had restored Castres' lead with a penalty but they were reduced to 14 men when Alexandre Bias was yellow carded. Dragons took full advantage of Bias' absence with Jones' penalty putting them ahead before Elliott Dee crossed under the posts. But Castres responded with Thomas Combezou's try coverted by to bring them within two points of the Dragons. Palis's penalty edged Castres ahead and the momentum swung in the home side's favour as Dragons' were reduced to 14 men after Dorian Jones was shown a yellow card for a late tackle. Alex Tulou crossed for a fourth try which secured a bonus point for Castres but Palis failed with the conversion. Dragons reduced the home side's advantage with nine minutes remaining through Meyer's kick but Castres held on for victory. Newport Gwent Dragons director of rugby Lyn Jones said: "It was a big effort from the players and they gave everything they had. "It ebbed and flowed and anybody could have won that in the end and perhaps Castres had a little bit too much advantage from the first half against the wind. "We scored some really good tries and put a lot of pressure on them and we were unlucky several times not to score more but that's the way it is." Castres: Geoffrey Palis; Romain Martial, Thomas Combezou, Romain Cabannes (capt), Remi Grosso; Daniel Kirkpatrick, Julien Seron; Saimone Taumoepeau, Marc-Antoine Rallier, Yohan Montes, Christophe Samson, Victor Moreaux, Piula Faasalele, Alexandre Bias, Johnnie Beattie. Replacements: Mathieu Bonello, Mihaita Lazar, Lucas Martinez, Alex Tulou, Theo Hannoyer, Julien Dumora, Remi Lamerat, Antoine Dupont. Dragons: Carl Meyer; Ashton Hewitt, Adam Hughes, Adam Warren, Nick Scott; Dorian Jones, Sarel Pretorius; Phil Price, Elliot Dee, Shaun Knight, Matthew Screech, Rynard Landman (capt), Nick Crosswell, Ollie Griffiths, Ed Jackson. Replacements: Rhys Buckley, Boris Stankovich, Lloyd Fairbrother, Cory Hill, Nic Cudd, Charlie Davies, Jason Tovey, Ross Wardle.